Legion, the Mass Effect series’ hive-mind A.I that enjoyed debating the morals of existence as much as it did shooting things in the face, was one of the series’ coolest characters. Now it’s getting a pretty spectacular action figure that any Shepard Commander worth their salt will ogle over. Clocking in at 13” tall, Legion comes based on his appearance in Mass Effect 3. On top of his armour, what’s actually cool is that ThreeZero’s figure attempts to mimic Legion’s body of wiring by covering the figure’s armature in a “suit” of soft PVC, so all the joints are hidden. A nifty way not just to hide joints but also keep the character looking just like it did in the games. 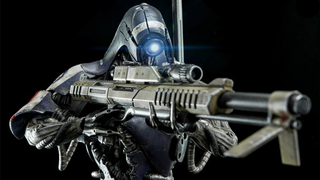 Legion feature’s a few LEDs in its chest and head, Legion will come with two guns — a Geth pulse rifle and his trusty Widow Sniper rifle, as well as the hands to hold them properly. You’ll have to pretend to have the intellectual debate about the rights of sentient A.I robots yourself though, as sadly that is not included. And also kind of the most important and interesting part of Legion as a character, but hey! At least you’re getting a really pretty action figure too. Legion will be available for pre-order at threezerostore.com for $190, ahead of a release later this year.